There is nothing to be gained from being cynical about albums like this. Clearly created as a very personal labor of love, "Anesthetic" captures the devoted musician and all-round good guy that we know from LAMB OF GOD exploring other sides of his songwriting and inviting a bunch of friends and idols to chip in with vocal cameos and instrumental contributions. This isn't meant to be some grandiose statement and, given how many tooth-rattling metal tracks there are here, it's no kind of startling revelation either. 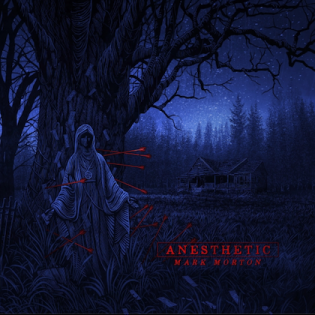 Instead, "Anesthetic" is what Mark Morton did for the sheer love of music and how much you enjoy it depends almost entirely on whether your taste coincides with his... although it's worth pointing out that the Morton's oft-proclaimed love of gangsta rap has mercifully been kept firmly under wraps this time around. The biggest surprise that "Anesthetic" has to offer is its opening track, "Cross Off", featuring the late Chester Bennington. For those who already loved his voice, the realization that Bennington had serious heavy metal pipes may not come as a great surprise, but for those of us who would rather be skinned alive than listen to LINKIN PARK, there is something genuinely shocking about hearing him wail over Morton's ferocious riffs, sounding more alive and vital than he ever did in his day job. Similarly, you may struggle to find many metalheads who regard Jacoby Shaddix as a vocalist of great note, but his performance on the cheerily straight-ahead "Sworn Apart" is endearingly punchy. Meanwhile, Josh Todd sounds very much at home barking and snapping his way through "Back from the Dead", a gnarly, punk metal stomper with bags of energy and an infectious, snarl-along hook. The most intriguing moments are inevitably those that stray furthest away from LAMB OF GOD's 21st century metal blueprint. Mark Lanegan could collaborate with Lil Pump on a musical version of Trump's last State of the Union Address and make it sound magical and profound, so it should come as no surprise that the former Screaming Tree's weather-beaten tones ensure that the dark and elegant "Axis" is a bruised, brooding, country-tinged gem. Likewise, the swaggering blue metal of "Blur" benefits hugely from SONS OF TEXAS vocalist Mark Morales's soulful rasp, not to mention the presence of ex-BLACK CROWES guitarist Marc Ford and drummer Steve Gorman and ALICE IN CHAINS' Mike Inez. Again, if that sounds like a tantalizing recipe, then "Anesthetic" is unlikely to disappoint. Myles Kennedy pops up a couple of times too, most notably on the slightly overwrought "Save Defiance"; a decent but unremarkable ALTER BRIDGE facsimile that is more than compensated for by Chuck Billy's bowel-mincing bellowing on balls-out thrasher "The Never". Arguably the least well-known contributor here, New York singer-songwriter Naeemah Maddox, provides "Anesthetic" with one of its most distinctive moments: "Reveal", an airy alt-rock stroll. The song displays a lightness of touch that is largely absent elsewhere, propelled mellifluously along by the beats of CLUTCH's Jean-Paul Gaster and highlighting the unsung subtlety in Morton's playing along the way. The other well-kept secret spilled on "Anesthetic" is that Mark Morton is a pretty good singer: on "Imaginary Days", he turns in a gritty and impassioned performance, adding a spark of character to an otherwise fairly perfunctory post-grunge hard rocker. An album that is perfectly happy to stray into the middle of the road, "Anesthetic" could easily reach a huge, mainstream rock audience. Heavier moments aside, it's the sound of a musician who is thoroughly at ease with his own artistry, and while we might expect Morton's next solo album—if such a thing actually happens—to be a more coherent and revealing affair, this first attempt is so full of humble joy, perfectly pitched performances and brotherly/sisterly love that its lack of real revelations hardly seems to matter.